In remote pasts, it was realized that the land plant obtained nourishment from soils through their roots. This idea was supported by the common practice of additions of animals and plant manures to the soils for increasing the productivity of the crops. Only during the first half of the 19th century botanists began to understand that the plants grow and develop only when these are supplied with certain chemical elements. These elements were termed as essential elements as without these elements the plant was unable to live or grow. These elements are absorbed by roots mainly as inorganic ions from the soils. The source of these inorganic ions in the soils was mineral constituents of the soil. Thus, term mineral nutrition was suggested to refer to an inorganic ion obtained from the soil and required for plant growth. Of many elements detected in plant tissue only 16 are essential to all higher plants. Experimental evidence by growth experiments in nutrient solutions for each of these elements suggest that in the absence of each essential element, plants develop deficiency symptoms due to nutrition disorder. There are two principal criteria by which an element can be judged essential or non-essential to any plant. Either criterion is sufficient to demonstrate essentially and most elements in our list 16 have met both. An element is essential if the plant cannot complete its life cycle i.e., form viable seeds, in the absence of that element. An element is essential it forms part of any molecules or constituent of the plant that is itself essential in the plant, e.g., N in proteins and Mg in chlorophyll. The elements that are required in relatively larger amounts by the plants are called macro-nutrients. These include carbon, hydrogen, oxygen, nitrogen, potassium, phosphorus, Sulphur, calcium and magnesium. The macro-nutrients are absorbed by plants in different chemical such as K+, Ca, Mg2+, NO3-, H2PO4-, etc. The elements like boron (B), chlorine (CL), copper (Cu), iron (Fe), manganese (Mn), molybdenum (Mo) and zinc (Zn), are required in relatively smaller amounts, therefore, called micro-nutrients. The micro-nutrients are available to plants either as inorganic ions or un-dissociated molecules or organic complexes (e.g., chelates). In inorganic form, the micro-elements are supplied as borate (BO3-3), chloride (CI), cupric (Cu2+), ferrous or ferric (Fe2+ Fe+), manganese (Mn2+), molybdate (Mo) and zinc (Zn2+). Sometimes microelements are required in extremely small amounts, these microelements are called minor or trace elements. Sodium is an essential microelement to certain salt-mash species in which carbon dioxide assimilation in photosynthesis takes place by C-4 dicarboxylic acid pathway. Cobalt is an essential microelement to wheat and one legume species. Silicon is essential to certain grasses and horsetails with naturally high silicon content. Selenium is essential for the growth of certain species of Astragulus, a plant growing in saline soils. Nickle has been shown to be an essential component of enzyme. The autotropic higher plants obtain nutrients necessary for their growth and development from three sources in the environment, namely: atmosphere, water, and soil. The Atmosphere provide carbon dioxide and oxygen. All the carbon atoms, plus most oxygen atoms (approximately two third), in the dry matter higher plants is derived from carbon dioxide. The other source of oxygen is water. The atmosphere oxygen is used for oxidation in respiration. During the process, it is reduced to water (respiratory water) which mixes with water already present in the plant cells. A small amount of atmospheric oxygen is incorporated into certain organic constituents in the process called oxygen fixation. Some higher plants (legumes) fix atmospheric nitrogen into nitrogenous compounds through micro-organisms living in their roots usually (root nodules). Finally, trace amounts of ammonia and Sulphur dioxide gases sometimes present in the atmosphere are also assimilated by some plants. Water is the second source of nutrition to the plants. The source water for the plants is the soil water absorbed through roots. Water is added to the plant material mainly via hydration and hydrolytic reactions. For example, when fumaric acid converted to malic acid in TCA cycle, water is added to the fuinaric acid (hydration), and when the starch is degraded (hydrolyzed), there is a small gain in dry weight of the products because water is chemically added. Moreover, the water is a reactant in the light reaction in photosynthesis. The hydrogen of water is incorporated into the organic matter of the plant and oxygen is released during the process. Soils are the heterogenous and variable mixture of inorganic mineral particles (sand, silt and clay), decaying organic matter (humus), and living micro-organisms, along with air and various inorganic molecules dissolved in water. The mineral particles are present as sand, smaller silt and still smaller clay, all composed mainly of silicon and aluminium. The clay mineral fraction is more abundant in many soils. The clay minerals consist aluminium of and silicon largely and their surfaces become negatively charged because some atoms of aluminium and silicone are replaced by manganese or iron. Such replacements result in availability of negative sites on the clay particles so that dissolved cations are adsorbed on their surfaces. Similarly, organic matter of the soil also has negatively charged surfaces. The phenolic compounds in the humus ionize. Their carboxyl groups (-COOH) ionize into -COO- and H+ ions, hydroxyl groups (-OH) into O- and H+ ions. These negative surface charges of soil particles are important in the adsorption of mineral cations to the surface of particles. Because the adsorbed cations are not easily lost by leaching when water moves down through the soil, so they provide a nutrient reserve available to plant roots for absorption. Mineral nutrients adsorbed on the surfaces of soil particles can be replaced by other cations in a process known as cation exchange. For example, replacement of K+ and H+ is an important cation exchange. The organic acids such as malic acid, produced during respiration into the roots, ionize and release H+ into sol which replace K+ adsorbed on the surfaces of mineral particles of the soil. Mineral anions are usually repelled by the negative charges of the soil particles. Thus, the anion exchange capacity of most soils is small as compared to cation exchange capacity. Among the most commonly required anions, phosphate, nitrate, sulfate and chloride are more soluble and all are repelled by the negatively charged soil particles. Because of this repulsion these are leached from soils as water passes through it. Phosphate and sulfate ions may bind to soil particles containing aluminium or iron. The positively charged iron and aluminium ions have hydroxyl groups that can be exchanged with sulfate, phosphate and other anions. 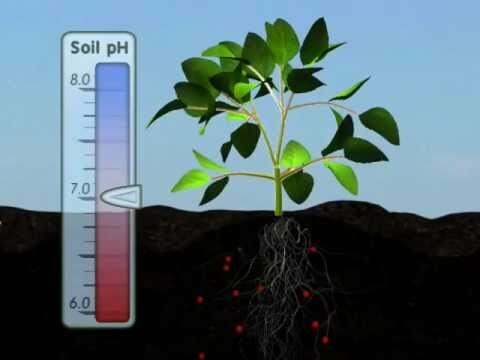 The soil pH (hydrogen ion concentration) effect the absorption of mineral ion. The soil pH can affect the growth of plant roots and soil micro-organisms. Root growth is generally favored by slightly acidic pH values. Soil pH also determines the availability of plant nutrients. A low pH favors the weathering of rocks and the release of ions such as K+, Mg2+, Ca2, Mn2+. At low pH values, the salts present in the soil as carbonates, sulfates and phosphates are more soluble. Increase solubility facilitates absorption by roots.